As people who attend weddings for a living, we have obviously seen a lot of weddings. Tom and I have seen all colour combinations, styles and themes. This means we are well placed to give our clients an idea of what will and won’t work, and I always say to our clients that I am always contactable to talk anything regarding their wedding, not just photography. From being unsure which side of your head your headpiece should go (on the right, if you’re wondering!) to where your DJ’s kit will be better placed in the room, I am always here ready to listen when you have tested the patience of your bridesmaids! One of the key pieces of advice we will always give however, is regarding your wedding dress. Actually we have two. Firstly it is to try on every style that exists, even if you think you know what you want. One of the most common things we hear from brides is ‘It was completely different to what I though I would go for!’ Even if you know you don’t want the big fairytale dress – try it on anyway! When else will you have the chance to try on a big meringue of a dress – have fun whilst you are looking for the one! However, my main piece of advice is regarding the actual wearing of your wedding dress on the day. It’s a major piece of advice actually: HAVE FUN AND LET GO! Yes the dress is white/ivory. Yes it probably cost you a month’s wages. Yes it is possibly the most beautiful thing you have ever worn. But you only wear it ONCE. Make the most of your time in it. If it is pouring with rain, who cares? If the grass is a bit damp and muddy, who cares?! Once you are past the ceremony, it’s time for celebrating. As photographers, we would rather work with a bride who is willing to let go and go out and enjoy herself, not worrying about the spec of dirt that ends up on the hem (that’s what Photoshop is for!) because we know we will get amazing wedding photography that shows the couple having the time of their lives. Do you really want to look back on your wedding with regret that you didn’t let go? Or do you want to look back and think wow we had so much fun! Perfect case in point this weekend was the lovely Rachael. Looking stunning in her full skirted Maggie Sottero dress, unfortunately the weather was not on our side. We postponed taking the couple out into the grounds during the reception drinks of their Easthampstead Park wedding, hoping the rain would settle later on . We even managed to persuade the venue to let us do the confetti shot inside! However, when it came to wanting to photograph our bride and groom later, it was still raining, and harder. Our couple were no strangers to being photographed in terrible weather, the wind and drizzle on their Wells-next-the-Sea pre-wedding shoot challenged their resolve so we had a feeling they may be valiant, and they were! Agreeing to go out for wedding photos in the rain, at first we used the heart shaped umbrella we used in their pre-shoot, but they were soon persuaded to go for it. 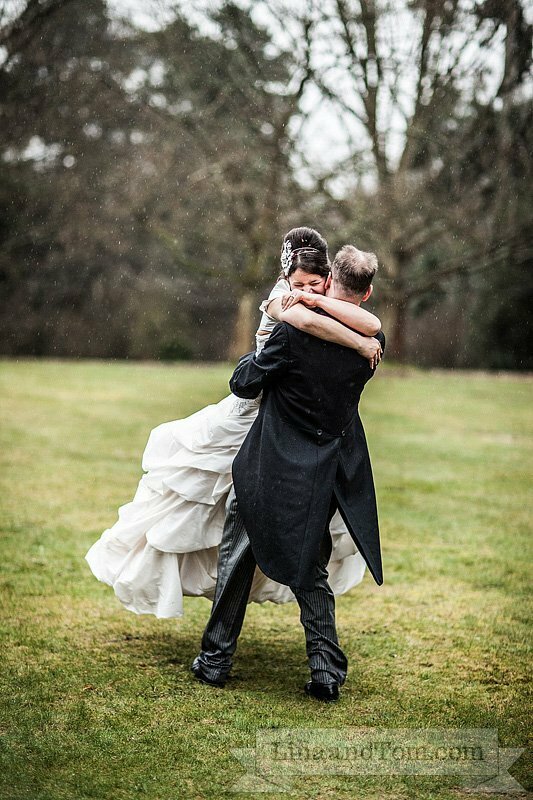 The taster of the day just had to be this fantastic shot of Nik swinging Rachael around in the rain, the shot is utter joy and we love it! When we returned inside Rachael’s train was soaked through and the bubble hem dirty but she didn’t care and just look at the result! It was so, so worth it! 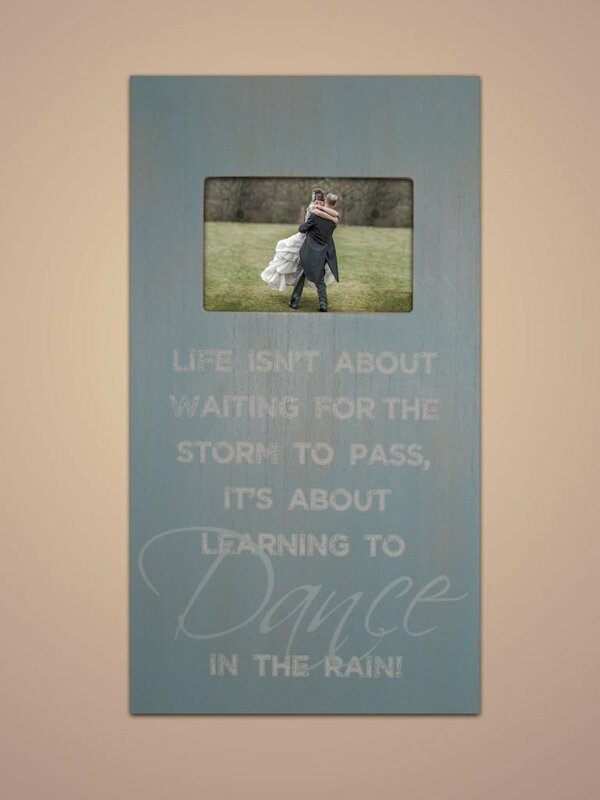 Even if you have great weather, maybe your venue backs on to woodland – don’t fret over the mud, go in and create gorgeous memories to last a lifetime. Tom and I always try and get new perspectives on venues, and sometimes walking that little bit further can give you beautifully unique wedding photos. Here’s another big tip: bring different shoes! You’re not going to want to venture far or on grass in your four inch platforms, so bring a different pair of comfy shoes for your photos, particularly easy if you have a full skirt. On Saturday evening, Rachael was heard saying. “I’m so glad I brought my wedges!” So were we! So please ladies, getting married in the UK means you can’t predict the weather, so what will be will be – whatever you end up with just concentrate on having the best day of your life!